Rubber is a topic we haven’t covered much on this blog so this is overdue! The main thing we hear is that people don’t really understand what types of rubber are out there or what they need for an application. Often people will ask for “neoprene” since it’s the only name they know. Neoprene has obtained a good reputation because it’s similar to a multi-tool: it does many things good, but it also isn’t optimal in many applications and a discussion with a rubber expert can lead you to a much better rubber choice. 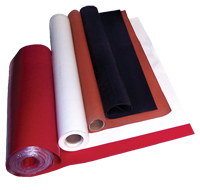 Several other types of rubber including EPDM, natural gum, butyl, Viton, silicone, and SBR exist. In addition, each of those types of rubber exist in various strata of quality – general purpose, commercial grade, and premium grade. For example, natural gum rubber while being ‘natural’ is actually a premium grade product. We know of cases where people get quotes on natural rubber, primarily because it comes in some colors, and are shocked at the price. We’ve said this before and we’ll say it again: with plastics (and rubber) you will pay a premium for color with almost every product. When it comes to applications if at all possible it is best to take the default color it comes in. Rubber varies widely in properties. For example, “neoprene” is not resistant to some common chemicals and is poor with extreme temperatures. But if you’re unsure of your applications requirements you may use it in a place it will fail. Likewise, Safeguard™ gum rubber, while expensive, has exceptional UV-resistance and functions well over a wide temperature range. Other rubbers have severe limitations with UV and mechanical properties. Again, you wouldn’t know if you didn’t ask! Redwood Plastics and Rubber has an excellent line card breaking down many types of rubber to various categories and giving their strengths and weaknesses. Click on the link in the previous sentence to view a downloadable copy.